On this 259th anniversary of the Acadian deportation, those researching their Acadian heritage might find the research guide, Acadians of Nova Scotia, New Brunswick, Prince Edward Island, Newfoundland of interest. It consists of Acadian Parish Registers under the French and British regimes in addition to the modern-day period under Confederation. 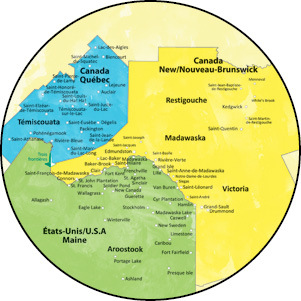 Click on this link, Acadians of Nova Scotia, New Brunswick, Prince Edward Island, Newfoundland, to see a 162-page downloadable document that will help you find your family’s name in community parish records, etc. The Acadian Congress takes place August 8 to 24, 2014. The map below indicates the areas where many of the Congress activities will take place. Source: Henry Wadsworth Longfellow, Évangéline and other selected poems – Penguin Books, 1988.